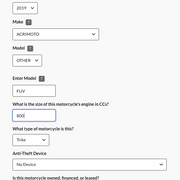 I just updated my car insurance and for a joke, wanted to see if I could get a quote for an "Acrimoto" (see screenshot). I already have 2 cars and a very good record. It would cost $184 a year without comprehensive or collision. Just a basic coverage. I guessed at the engine size (800? ), model (FUV? ), and is it really a trike? Also I didn't claim to have any experience in riding a motorcycle and did not take any classes (because we don't have to in Oregon, I believe). Sounds like a great deal. Hope my insurance is similar. When it comes time, talk to an actual agent - the fact that it is fully enclosed should drop the rates significantly. (01-22-2019, 10:52 PM)CharonPDX Wrote: When it comes time, talk to an actual agent - the fact that it is fully enclosed should drop the rates significantly. I thought $184 a year was great! My fully insured 2017 Subaru Impreza ($20k new) costs $194 per 6 months. I've never had comprehensive insurance before (I've never had a new car, let alone one that cost over $10k). So yeah, $92 for 6 months or $15 a month isn't too bad. While *some* of it is about the cost of replacement of the car, a LOT of it is about accident history of people driving that vehicle (*not* you - that car). So if there are more accidents per 10K drivers that involve (say) Porche Turbo, that vehicle is going to cost more to insure than other vehicles that cost as much but with lower accident rates (such as a Rolls Royce). If there *is* no accident history because the vehicle is a new model/type ... they guess. For a new vehicle type, *definitely* shop around between a BUNCH of insurers, and don't just go to your current insurance for a quote. With no medical coverage it’s like $55 a month with $100 COMP, $500 collision. Not happy at all with either of those. State Farm is almost double the cost of our Geico auto plan. Same with home insurance. 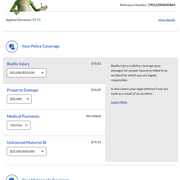 (02-15-2019, 03:41 PM)harriska2 Wrote: State Farm is almost double the cost of our Geico auto plan. Same with home insurance. They used to be for me as well, I was state farm, then switched to a much cheaper Geico maybe 6 years ago, and a year ot two back I switched back as Geico steadily increased me 5-10% each year. No accidents or anything, was just a steady increase until they ended up being higher than SF. Im going to reach out to Geico now and see. I do remember Arcimoto stating that American Family can quote it as well..